This winter, China's tourism and recreation industry is seeing new activities: helicopters rides to go skiing and later eat hotpot food at custom resorts; shooting pictures with reindeer; visits to ice and snow museums. Northeast China, the Xinjiang Uygur autonomous region in Northwest China, Japan, Switzerland and North America, have emerged as the top skiing destinations for avid Chinese skiers, according to Qunar, an online travel firm that was acquired by Ctrip, China's largest online travel agency. More affluent millennials, including those born after 1995 and 2000, spend most of their leisure time skiing and snowboarding. Ski lovers in China, whose numbers are rising, go skiing almost four times a year on average, and their per-capita spend exceeded 1,300 yuan ($191) each time. The volume of online searches on mobile phones for skiing products surged 79 percent over last winter, Qunar found. "From a pure sport, skiing has become a comprehensive travel experience. It comprises admission tickets, hotels, training, snow museum visits and delicacy savoring," said Song Yawen, director of themed tours at Qunar. The 2022 Winter Olympics will be held in Beijing and Zhangjiakou city, Hebei province, located about 200 kilometers northwest of Beijing. In the run-up to the quadrennial event, these places are attracting skiing fans. High-speed trains will soon connect Beijing and Zhangjiakou, and shrink travel time from four hours to about one hour. "By buying our new recreation service online, a consumer can take a 35-minute helicopter ride from Beijing to Chongli for 3,000 yuan. Four people can fly at a time. Hanging baskets can carry along cargo like skiing gear," Song said. "Besides, we have introduced some snow-related travel products with activities like snowmobile rides, sledge rides, ice sculpting and winter fishing." In Ewenki autonomous banner of North China, playing with reindeer and dog sled is part of ice-and snow-themed tour packages. For Tian Shen, 26, a bank employee and an experienced skier in Beijing, winter means hitting the white slopes at various places in China. 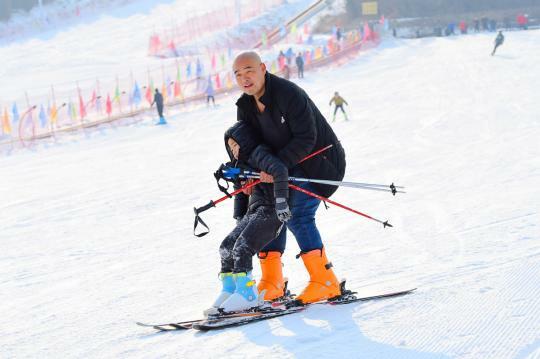 She has been going to ski resorts in Zhangjiakou almost every weekend this winter. Around New Year's Day, she made a trip to Songhua Lake, Jilin province in Northeast China, one of the most popular skiing destinations in the country. "I love the feeling of fast sliding, and as control over my body gets better and better with practice, it makes me feel good. This year, I plan to try more difficult movements of snowboarding that require skill," Tian said. She said a season card costs 16,800 yuan and allows one to go skiing for unlimited number of times at a ski ranch in Zhangjiakou. There are many other discount options and lucky draw opportunities to get free season cards.